(d) Listed entity shall ensure that, for the purposes of quarterly consolidated financial results, at least 80% of each of the consolidated revenue, assets and profits, respectively, shall have been subject to audit or in case of unaudited results, subjected to limited review. (f) Statutory auditor of a listed entity shall undertake a limited review of audit of all the entities/ companies whose accounts are to be consolidated with listed entity as per AS 21.
more than 2 layers of Subsidiaries. As ROC has started issue 'Show Cause Notice" in respect of non-filing of e-form CRL -1 disclosure in respect of more than 2 layer of subsidiary. 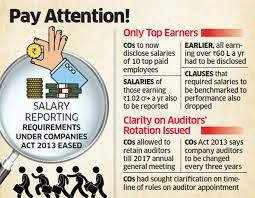 As ROC has started issue 'Show Cause Notice" in respect of failure to provide information in the directors report as regards to CSR spending. 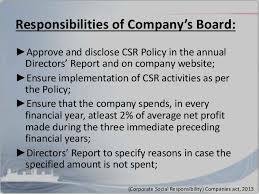 It is advised that company has to mention in the directors report “ the reasons for not spending the CSR amount in case if they don’t spend CSR amount during the current year . This will save the company from receiving show cause notice from Registrar of Companies. 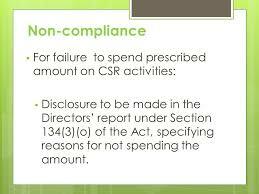 The following may be the reasons that may be stated in the Director’s Report for not spending CSR amount. 1. Liquidity crunch--Company is required to spend on modernization of the existing machinery and borrowed amount is not sufficient to meet up the requirement for the fund and hence CSR has not been made. The shortfall will be recouped in the next year. 2. Time to ascertain proper CSR activities was very short and hence the Company could not spend required amount on CSR. The shortfall will be made good in the next year. 3. Fire or natural calamity that took place in the factory and hence, liquidity crunch. 4. Company Incurred loss in any financial year immediately preceding three financial years. It is not clarified by the MCA whether unspent CSR amount can be carried forward and spent in the succeeding year or not. • Name of every employee who was in receipt of remuneration not less than Rs. 1.02 Crore per annum or if employed for a part of financial year with a remuneration not less than Rs. 8.50 Lakhs p.m.
• Name of every employee who was in receipt of remuneration in excess of MD/WTD/Manager and holds shares along with his dependents, not less than 2% of the equity shares of the Company. • The statement also to include the designation, remuneration, nature of employment, qualifications, age, last employment, percentage of shares, etc. However, if board decides by a board resolution , for those employees who are drawing more than Rs 5 lacs per month who are working in abroad, their salary details need not be published. This is being perused by many top IT companies who have their major chunk of employees working in abroad. With Companies amendment act 2017, section 92 being notified, there is no necessity to attach the abstract of annual return with Directors report. However , if your company has website , you have to upload the annual return there and you have to give the link of the Annual Return in the Directors Report. The Amendment says only for those companies which do have websites . If the company do not have any website , no need to comply the above provision. Further , the details about the indebtness is also now omitted. Many thanks for your voluntary service. keep it up. Nice to see the useful info. Great service to needy!